Una Armina, an Imperial savant, is the curator of the Museum of Oddities in Crucible, New Sheoth. She will offer a "finder's fee" in exchange for Oddities found throughout the Isles in the related quest. She has a very poor short-term memory, and will forget things that happened minutes ago. She spends her entire life maintaining her pride and joy, the museum, tirelessly providing guided tours to the occasional visitor, most notably Ushnar gro-Shadborgob at 10am every day. Her dedication means she rarely sleeps and her life is literally turned upside down. After only one hour of sleep, she wakes up in her quarters at 7am and immediately heads downstairs and unlocks the door. She will then spend the next 18 hours strolling around the Museum, interrupted only by a one-hour nap at noon. At 3am in the morning, Una finally locks the front door and heads down the street for a two-hour meal at Sickly Bernice's Taphouse. She returns to the museum at 5am and spends an hour amidst her Oddities before she heads upstairs and finds her bed at 6am. 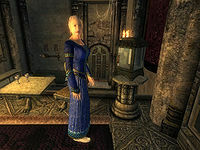 While most citizens find her museum laughable and not many visitors frequent her museum, Una can afford expensive clothing: the rare and expensive blue silk shirt usually worn by the Countesses of Cyrodiil, with the matching, and equally expensive, blue silks. She also wears a pair of white mage's shoes and carries her museum key and a surprisingly small amount of gold. The Museum with the simple-minded proprietor is the talk of the town; all over Crucible and Bliss people can be heard saying: "That Museum of Oddities is a joke, although I hear Una Armina will pay for certain items. ", "I don't visit the Museum of Oddities, but Una Armina is always looking for new items to display. ", "If you find something unique, it's worth checking with Una Armina. ", "Una Armina runs a museum in Crucible. ", "Una Armina runs the museum. She's always looking for new pieces for her collection. ", "You should stop by the Museum of Oddities. I understand Una is always looking for more items to display. ", "I've never found anything myself, but Una's always looking for more." and "I hear the owner doesn't even remember what she's got in the place." In the artist community of Hale, local poet Halion has dedicated a small rhyme to Una and her Oddities: "In Crucible you'll find a place, a museum with all manner of things. A reward you'll get if to this place something strange and new you bring." Meanwhile, in Split, the demented Atrabhi will mischievously tell you: "Una Armina has all the pieces she needs to fill her collection. Nothing's missing." The very first time you visit the museum, Una will give you a warm welcome, offer you a free tour and immediately task you with finding oddities for the museum: "If this is your first time to the Museum, perhaps you would care for a tour. I am the curator of the Museum of Oddities, Una Armina. Have we met? You look familiar... Anyway, I'm always looking for new exhibits, so remember me when you come across anything Odd." If you talk to her during her rare trips outside the Museum, she will not offer you a tour but will still ask for Oddities: "Hello, I'm Una Armina. Perhaps you've heard of my Museum of Oddities? There you can view all the finest Oddities of the Realm. I'm always looking for new exhibits, so be sure to think of me when you see anything Odd!" When asked about Oddities, she will explain: "I'm always looking for new Oddities to add to my collection. Anything unusual, bizarre, strange, or disturbing -- bring it to me! I do pay a nominal finder's fee, but of course the real reward is your contribution to posterity. Do you have anything that you'd like to contribute to the Museum?" If you accept a guided tour around the museum, she will be delighted: "Wonderful! Follow me, and I'll show you around my little collection of Oddities. Look closely and you'll see a tiny skull. These pygmys used to live in the Shivering Isles until they were all eaten by Grummites, poor dears! Here's a real Oddity for you -- an arm of one of the Gatekeepers! This one was killed by... oh, I forget now. A lovely specimen in any case. Up here is a little beauty. The Ring of Desiccation. Walk on water and breathe underwater at the same time. Odd, if you think about it for a minute. I hope you've enjoyed the tour! Feel free to stay and browse for as long as you like." It is possible to find multiple copies of Una's desired oddities, and it is also possible to steal back an oddity and attempt to hand it to her again. The 1st time you deliver an oddity, Una will always accept it and hand you a reward. The 2nd time, she will always casually reject you. If you Stole the item from the Museum, a confused Una will present you with the option of donating it. Finally, if you ask her for a Tour and the oddity is displayed in the Museum, a proud Una will provide a bit of explanation on the oddity. "Ah! How deliciously odd! I've never seen a Blind Watcher's Eye before. It will have a place of honor in the Museum." "Oh... I already have something in the Museum very similar. But don't give up, I'm sure something truly Odd will turn up soon." "I could swear I once had a Blind Watcher's Eye just like that.... I would like to replace it, but the funds just aren't available." "Here you see the Blind Watcher's Eye. A most unusual specimen collected at great peril by... some intrepid adventurer!" "Well isn't that just the Oddest thing! A dagger that heals people. Who would make such a thing, and why? I absolutely adore it!" "That's so strange. I got one of those just the other day. Sorry. Maybe you can start your own collection of oddities, hmm?" "Oh, yes, I have one of those... no, that's the one that I misplaced the other day. I'd really like to replace it, but funds are so tight..." "Here's a new addition to the Museum, one of my favorites. A dagger that heals whomever it cuts! Isn't that deliciously Odd?" "Wonderful! Looking at the tentacle, I'm not sure whether to be disgusted or terrified. Just the kind of thing I'm looking for!" "Too bad... I already have a deformed Swamp Tentacle. But next time I'm sure you'll find something truly Odd, don't worry." "Interesting... it looks vaguely familiar, like I once had one of these on display. I only wish I had the funds to buy it off you..." "Here in this case is a disgustingly deformed Swamp Tentacle. Such a freak of nature has never been seen before, and hopefully not since either!" "This is unsual [sic]! The ashes of a famous madman are perfect for my Museum!" "Really? But I already have Din's Ashes. I'm afraid someone must have taken advantage of your gullibility." ‡ "Where did you find that? I was sure I once had Din's Ashes on display here... I wish I had the funds to replace them, they were very popular...." "Here we have the mortal remains of a fellow named Din, who as I understand was driven mad and killed himself, a truly Demented act." "What a perfect little Oddity! Just strange enough that it makes you go "Hmm?" but not so strange as to become a Miracle or an Omen. Thank you!" "Honestly, I'd never seen one before until recently, and now to have two turn up! That's Odd in itself, isn't it? But I really can't use it, sorry." "What luck! I seem to have misplaced the one I used to have on display. I really can't afford to buy it from you though." "A lovely little Oddity -- a key made from a Hound's Tooth. And no one even knows what it opens, imagine that! Shall we move on?" "Hmm. A bowl that you mix potions in. Doesn't seem all that Odd to me... well, I can see you're trying, so I'll find somewhere to put it." "We already have one of those, I'm afraid. It wasn't all that Odd to begin with, honestly. We certainly can't have two." "Seems like I've seen one of those before. But I guess it is Odd enough for the Museum... but I certainly can't justify buying it from you." "This one is perhaps more unusual than truly Odd, but some people enjoy it. Truth be told, I only display it as a favor to the donor." "That's amazing! The pelvis of Pelagius III! An honored madman if there ever was one!" "Another Pelvis of Pelagius? I don't think that's possible, honestly. It must be a fake." ‡ "But... I already have... or had.... How odd. It seems to be missing. I'm sorry I don't have the funds to purchase it from you. Again." "Over here is the Pelvis of Pelagius, the greatest Emperor that Tamriel has ever seen, as well as being completely mad." "Oh, how cute! Look how it tries and tries to scream but no sound comes out! This is perfect for my museum!" "Oh. Another Mute Screaming Maw. I already have one of those on exhibit." "I've been looking for one of those to replace the one I used to have on display. At least I think I did. I truly wish I could afford to buy it..." "I love this one. It's a Screaming Maw that can't scream! Isn't that just the Oddest thing you've ever seen?" "Oh, my. How wonderful! A ring that removes people's clothing! This will be one of my most popular exhibits, I'm sure." "I'm so sorry. I already have a Ring of Disrobing. There's really no place in a Museum of Oddities for duplicates, as I'm sure you can understand." "That's just like one that's gone missing from my Museum. If only I had the funds to replace it." "The Ring of Disrobing -- removes your clothes if you put it on. Now, don't you go trying it! I have enough Oddities on display already, hahaha." "Oh my, that is Odd! I've never even heard of such a thing before. We'll find a nice place for it here in the Museum." "You wouldn't think there would be two of those in the world, now would you? Sorry. Keep looking and I'm sure something truly Odd will turn up." "That looks just like one I used to have. Or maybe I saw it in a book... in any case, I wish I could afford to buy it from you, but...." "Here's something truly Odd -- a Soul Tomato! A tomato that can act like a soul gem! No one has yet been able to explain it." "Two Tibers are always better than one, I always say! We'll take good care of him here in the Museum, don't you worry." "That's too bad. I already have one of those. Can't very well have two in a Museum of Oddities, now can we?" "I already have one of... wait a moment, no, that's the one I can't find now. 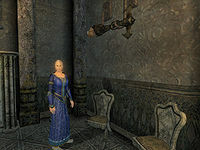 If only I had the money to buy it off you...." "This is a lovely little Oddity -- a two-headed Septim! Take your time, there's no rush." 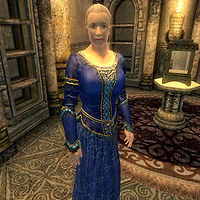 † If you deliver the Sheogorath-Shaped Amber after completing the main quest, Una will change her acceptance speak to fit your status: "Well, if it doesn't look just like you! So lifelike! My patrons are going to absolutely adore this." Additionally, during a museum tour, she will describe the Amber like this: "This right here is one of my favorites. A lump of amber in the shape of your head, my Lord! A very popular item, too, if I may be so bold." ‡ These lines of dialogue will never be heard during normal gameplay, as you can only obtain one of the required item. I would love to get a piece of the old Gatekeeper for my Museum. His head maybe, or an arm... he certainly was a unique specimen. That Xedilian place just sounds positively stuffed with Oddities. Surely something could be spared for my museum? Too bad someone didn't bring me this Chalice for my Museum. Would have made a fine addition to my collection. I could have told Syl who the traitor was, if only I could remember! Damn my failing mind! The question is, who gains from the Torch being relit? And who loses? That's what you should be asking yourself. I was always perfectly loyal to the old Duchess. As I am to the new Duke, whoever it may be. Of course the Fringe was destroyed. This is how the Greymarch always begins, you know. Always nice to have a new Gatekeeper. I hope that when this one gets killed, someone thinks to bring me something for the Museum. It was truly shocking. The guards just dropped dead, all across the city! I'm glad it's over, but it makes you wonder, doesn't it? Sheogorath hasn't disappeared. Did you know that he and Jyggalag are the same person? It's all very hard to understand. I hope someone saved a piece of Jyggalag's armor. Just the thing for my museum! Una uses a skeleton mesh dedicated for beast races, instead of a human one. The result of this bug can be seen with a Detect Life spell, as the pink haze covers a piece of her invisible tail.